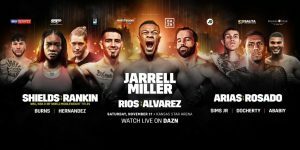 Heavyweight star Jarrell Miller continues his rapid rise, Claressa Shields defends her IBF, WBA and WBC World Middleweight titles against Hannah Rankin and Brandon ‘Bam Bam’ Rios comes home in an all-Mexican clash in a huge night of action at the Kansas Star Arena and Casino in Mulvane, Kansas, on November 17, live on DAZN. Shields became a two-weight World ruler on home turf in Detroit in June in just her sixth pro fight with a points win over Hanna Gabriels to add the IBF and WBA straps at 160lbs to her IBF and WBC Super-Middleweight belts she claimed in August 2017 and defended in January. ‘T-Rex’ puts the Middleweight straps on the line against Scotland’s Rankin (5-2 1KO) who crossed the pond once again for a World title shot having challenged Alicia Napoleon for the WBA Super-Middleweight title in August in Long Island, NY, having picked up the WBC Silver Middleweight belt two months earlier in Scotland. Information on tickets will be released at tomorrow’s press conference.